1. At the time of the email's creation, Charlotte had sold 1,645 Football Seat Licenses - about 33 percent of the goal of 5,000 for a football program to begin. 2. A payment plan has been created to pay for FSLs, in which a monthly amount will be charged to a credit card until the FSLs are paid in full. For more information on this option, call (704) 687-4950 or (704) 687-4949. 3. The cost of season tickets for football cannot be set until a stadium plan is finalized, as well as a schedule. 4. Early efforts at marketing have been focused on those who pledged to buy FSLs. A volunteer force is being created to continue to target that group. Mainstream advertising toward the general public will begin in mid-June. 5. A coach would likely be hired in 2011. 6. With the tough economy fundraising will be targeted first toward those things necessary to start the program, such as facilities and staff. 7. To volunteer to help in the cause to bring football to Charlotte, call (704) 687-4950. Good luck......don't see it happening anymore unless private investors kick in. Hahaha! I knew you guys could not do this correctly. No marketing, people thinking someone else will pay for it. Way to go Niners. Ahhhh, finally. We shall see then end of this dumb football idea and focus on using the student fees to prepare for becoming the largest university in the state within the next five years. Just go ahead an end all athletic programs. I would rather have no sports at all than continue to watch this downward spiral. Glad they have a monthly plan now, that makes it a lot easier on me for sure. Whos the idiot? You cant have a football team with only 1500 fans!! We shouldnt even have to reach out to alumni to sell 5,000 tickets! You should be able to get that from the students and faculty alone!! Uhh...at any real school, student tickets should be free, and faculty certainly shouldn't be paying anywhere close to full price. Nice try, though. I wonder how many other FCS level programs ask a $1000 a seat on top of season tickets from its fans? FSL sales are pointless anyway. The lack of $2 or $3 million when we will be needing $40 for stadium/facilities seems insignificant at best. If we had sold all 5000 seats on day one or not one single FSL by 2013, the whole program's fate resides in the hands of donors and corporate sponsors. They're already several donors that have contributed significant donations and their names and contributions will be released to the public when the Athletic Department feels it will have the best impact. If we get the $20 mil for the football facilities/offices by 2011 then we play football, FSL sells be damned! I'm sure we'll get 3400 walk-ups on game day to fill those seats if they aren't sold by then. ATLANTIC SUN HERE WE COME!!!! Hey Everybody! 49RFootballNow is right! Nobody has to buy PSLs!!!! Forget about that pledge you made back in January We already got everything we hoped for - they said YES!! Big money sponsors should come rolling in any time now! Now lets all just sit back and wait for kick off!! 2:12 and 2:15 posters---you have NO IDEA what you're talking about. I'll leave it at that. It is ridiculously expensive to start a football program. The plan to build a 12,000 seat stadium on campus is not helping. I suggest using Memorial Stadium in uptown Charlotte until they can afford to construct a REAL stadium. They're desire is to go I-A, you have to maintain at least 15,000 attendance average over a 3 year period (IIRC). Hard to do in a 12,000 seat stadium and the inability to sell FSL's. 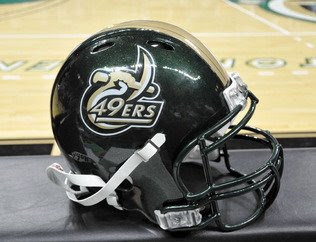 As an AppState grad, we know how to do football on the I-AA level, and I would love to see UNCC get a team (as I live in Charlotte). But, they are not starting off on the right foot with an endeavor this large. Best of luck, but a change in mentality may be necessary to be successful. How many CURRENT students will still be students in 2013? There should be 5,000 CURRENT students buying FSLs at $1,000 each! We had the largest turnout ever when the students voted football and they havent followed through with their commitment! Thats gotta hurt not having a football team. I had the best time in college tailgating in the fall for games. Sounds like UNCC has some bad alumni. What kind of school charges the students for tickets to football games? Why do you people comment when it is obvious you don't know what you're talking about? There will be SOME quantity of "free" student tickets. The only thing for sale RIGHT NOW is FSLs and no marketing has even started yet....geez people, get a freakin' clue.